Alpha Flight is an odd Point One issue because it is not a jumping on point for an ongoing series. 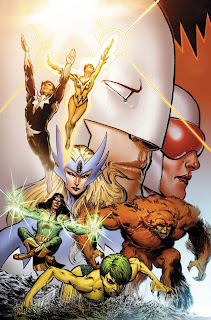 Alpha Flight is a series that is being resurrected, so I looked at this more as a primer. go read another tasty article on [insertgeekhere]. In this issue, we get to meet Alpha Flight, a team of Canadian superheroes. They were brought back to life during the Chaos War and now they continue to protect Canada. The country is thrown into chaos because of the upcoming election and poor economy. As we see each Alpha Flight member get called to help stop the damage, we learn about each member and the past that still haunts them. Ultimately, it is their past that put Canada in the danger they are fighting. I didn't love or hate this issue but I left it feeling intrigued. I felt like I had questions but not anything that hurts the story for me. The story did a great job introducing the characters and a bit about their different personalities. They also set the stage for ongoing political unrest, including in the ranks of the superheroes too. As the story unfolds, I am sure we will see what problems Northstar and Guardian have with the government. I wonder how long it will take Northstar to rejoin the team. Finally, it was a nice change to read a superhero comic not set in America. It does have a different feel, although it is hard to explain. I think that overall, this is a good introduction to this team and I am intrigued to see what happens next.